I often looked in the mirror and was disappointed with the person I saw staring back at me. I give him credit for he has accomplished many great things in his life for which I am proud. He has a beautiful wife and wonderful children. He had a successful athletic career at Knightstown High School and Central Michigan University. He has worked with and led many great teams during 13 years at a Fortune 500 company. These are all great accomplishments, but something is missing. The man I see in the mirror has not done enough to help his neighbor. Yes, he is involved in some community organizations, but there is so much more he has to offer others. The man in mirror needed to be challenged to do more! He needed to be challenged to make a difference by finding ways to give back to other people. In late March, I decided it was time to do more. I decided that I would embark on a service adventure that would have me volunteering my time to different organizations over a 52 week period. I shared the idea with my wife and she was instantly intrigued with the idea. She has always been a giving person and this adventure is exactly the kind of thing she enjoys. In early April, we decided to move forward with the project we are calling Impact 52. 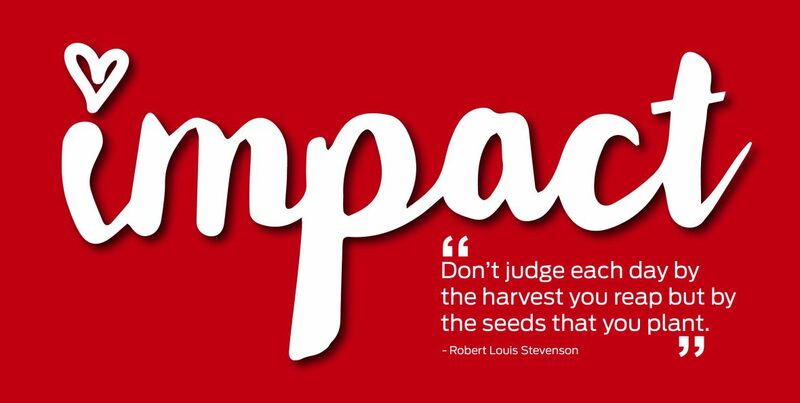 Impact 52 is a project that will allow for us to serve others in an effort to learn more about ourselves as individuals, our family, other people, and our communities. There are so many people in our communities at this time who need a positive in their life. Something that may help push them in the right direction, continue fighting, or just something to make them smile. There are also so many great organizations who work tirelessly to help out these people and these organizations need help. It takes each and every person willing to step forward to make that difference. Our communities are our responsibility and we must all do our part. We, Impact 52, have made the decision to do our part. We hope to make an impact on other people, but this project is also about the impact it has on us and our children. We want our girls to understand the importance of giving. We also hope to inspire others who follow our journey to get involved. Our tagline during the project will be to “Inspire change one week at a time”. We hope that other people will be willing to make a commitment to inspiring change. As we travel our service path, we want others to make a 13,26, or 52 week commitment to making a difference. We want others to share their stories of giving with us. By doing this, we can inspire more people to step forward creating an epidemic of giving. An epidemic that can sweep through our communities, our cities, and our states infecting others and making this world a better place. We are excited to start this journey on Tuesday, May 23rd. We will be spending time with Saints on the Streets Fort Wayne, an organization that does phenomenal work for the homeless of Fort Wayne. We hope you will follow our progress, share our stories, and maybe even join us during one of our volunteer experiences. We are at the beginning of our story. A story that we look forward to writing, living, and enjoying. Absolutely inspiring idea! There needs to be more people like you in this world.